Xfect™ RNA Transfection reagent는 다양한 종류의 mammalian cell (broad-range)에 microRNA, siRNA, mRNA 또는 sgRNA와 같은 여러 종류의 RNA를 효율적으로 도입 가능한 Transfection 시약이다. 생분해성 나노입자 (biodegradable nanoparticles)로 구성된 Xfect™ Transfection reagnet는 일반적인 Transfection 시약에 비하여 낮은 세포독성 및 높은 도입효율로 RNA Transfection이 가능하다. 특히 본 제품은 CRISPR/Cas9-mediated gene editing에 사용되는 Cas9 coding mRNA 및 single guide RNA 도입에 효율적으로 사용이 가능하며, Xfect™ Transfection reagent (Code 631317, 631318)과 함께 사용하면, DNA와 RNA co-transfection이 가능하다. Panel A. sgRNA targeting the 5’ end of the antisense strand of CD81 was synthesized using the Guide-it sgRNA In Vitro Transcription Kit. Panel B. An HT1080 cell line (2.0 x 105 cells) stably expressing Cas9 (HT1080-Cas9) was transfected with 50 pmol of sgRNA targeting CD81, either once or twice (lower graph), using the Xfect RNA Transfection Reagent. Seven days later, cells were immunostained with a CD81 antibody (Ab) conjugated to an FITC fluorophore and analyzed by flow cytometry. The percentage of cells that did not bind CD81 was calculated. A control sample, comprised of HT1080-Cas9 cells, was analyzed by flow cytometry, either without (top, left graph) or with (top, right graph) the CD81 antibody. Both single and double transfection with sgRNA resulted in a substantial increase in cells that did not bind CD81, indicating successful CRISPR/Cas9-mediated knockout of CD81. HeLa cells (2.0 x 105), HEK 293 cells (1.5 x 105), Human Dermal Fibroblasts (NHDF) cells (6.0 x 104), Mesenchymal Stem Cells (MSCs) (5.0 x 104), Jurkat Cells (3.0 x 105), and KBM7 cells (3.0 x 105) were plated in 12-well plates and transfected with 1 μg of mRNA encoding GFP with 5 μl of Xfect RNA Transfection Reagent. 20 hours later, cells were analyzed by flow cytometry and the % GFP-positive cells and the Mean Fluorescence Intensity (MFI) were determined. HeLa cells (2.0 x 105), Human Dermal Fibroblasts (NHDF) cells (6.0 x 104), and Mesenchymal Stem Cells (MSCs) (5.0 x 104) were plated in 12-well plates and transfected with 50 pmol of siRNA against luciferase using Xfect RNA Transfection Reagent. All three cell types were also transfected with 1 μg of pCMV-Luc using the Xfect Transfection Reagent. Luciferase assays were performed 48 hours post-transfection. For control samples, cells were transfected with pCMV-Luc but without the siRNA. 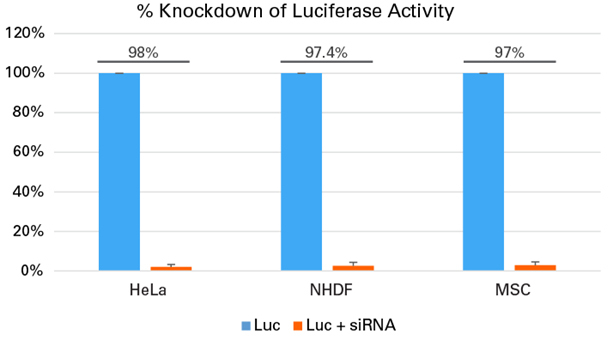 We observed a dramatic (>95%) decrease in luciferase activity in all the cells treated with siRNA.